Erin's Rhewsings: Alliances by S. Usher Evans (Razia, Volume 2) Cover Reveal and Giveaway! 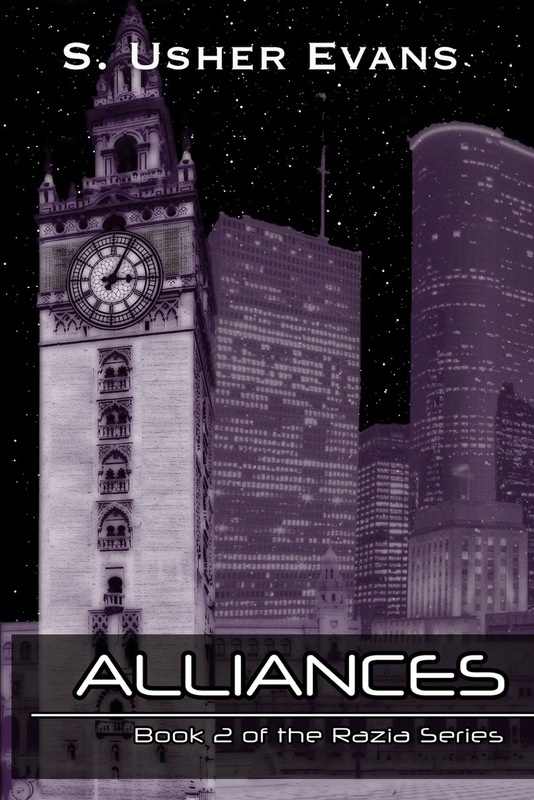 Alliances by S. Usher Evans (Razia, Volume 2) Cover Reveal and Giveaway! Piracy is a Game. Whom do you trust? Lyssa Peate has found a tenuous balance between her double lives - the planet-discovering scientist and space pirate bounty hunter named Razia. No longer on probation, Razia still struggles to be thought of as more than a chocolate-fetching joke, and Lyssa can’t be truthful to those closest to her. But both lives are turned upside-down when feisty government investigator Lizbeth Carter shows up to capture the same pirate Razia is after. Lizbeth’s not interested in taking Razia’s thunder; rather, she convinces the caustic bounty hunter to help solve a mystery. Somebody’s hiring pirates to target government ships, and there’s a money trail that doesn’t make any sense. From the desert planet of D-882 to the capital city on S-864, the investigation leads them deeper and deeper into a conspiracy that reaches to the highest levels of the Universal Government - and to one of the most painful chapters in Lyssa’s past. Pre-orders for Alliances will be available on Amazon Kindle begin January 1, 2015. You can read Double Life! The room was dark, with a single, dingy lamp hanging over a table where three men sat, each holding a hand of cards. They said little, except for the occasional grunt or movement to tap their grungy mini-computers to up their ante. The first sighed and rubbed the scruff around his chin. He reached into his pocket and pulled out a cigarette and a lighter. "You hear that Llendo is running for re-election?" he said, cigarette dangling from his mouth. "What else is new?" The short, squatty man and whose toes barely brushed the floor, threw a few chips into the virtual pile using his mini-computer. "The guy’s a puppet. There ain’t nothin’ that comes out of his mouth that ain’t been sent through the ringer about a million times." The other two men chuckled and shuffled around their cards. The third man, with a long face and sallow complexion, pulled two more cards for his own hand and shuffled them together and apart again. "But who else is there to vote for?" he asked, counting his cards and stacking them together again. "That general? You know that buffoon Peate works for him. He ain't getting my vote until I know he's gonna play along." The second shrugged and said, "Nobody’d vote for him in a million years." "You and your millions." The third rolled his eyes. "Everything you say has been done a million times." "Bah, can it," the first barked. "And hurry up and make your move." "I'm taking my time. Don't want to get fleeced again," the third said. "You're all a bunch of crooks." "Takes one to know one." The second man peered at his cards through a pair of thick glasses, hunched over. "I am retired," the first man said, sitting back and taking a long drag of his cigarette. "None of that piracy crap for me anymore. Getting too dangerous for me." "Gonna break a nail?" the second snorted. "Bad enough you got that girl. Whatsherface." "I hear she's doing all right," the third said. "Kidnapped Jukin Peate's brother and held him for ransom last year." "And what's she done since then?" the second said. "I'm just saying, it's unnatural to have a woman out with the men," the first said. He paused for a moment and began to smile. "Although I can't say I hate seeing her scamper around '882." "Shame she doesn't wear tighter pants," the second said. "I seen pictures. She wears these baggy things. I bet if she wore something that made her look like a girl, she wouldn't even have to fight nobody." "She could come capture me any day of the week. I don't care what she looks like," the third said. "I'd lay down and let her do whatever she wanted to me." "Care to test that theory?" The three looked up sharply at the sound of a distinctly female voice in the doorway. "Hey, hey," the first man said, standing up. "We don't want no trouble. We're retired here, lady." "You are," Razia said, stepping into the light with a smirk on her face. She turned her eyes on the third man in the room. "He isn't."